Autumn is one of the most beautiful times of the year because the leaves are changing colors and the flocks of birds are headed south. Take advantage of this transitory time by going out for a walk. Put on your fitness tracker, a warm sweater and some comfortable shoes, then head out into a world of bright oranges, yellows and reds. Walking in the brisk fall air won’t tire you out as much as the hot and muggy days of summer. You’ll return home feel fresh and invigorated. While you’re outside, you can even snap a few nature pictures with your smartphone and inspire your friends to get outside as well. Watching the big games on TV is a time-honored autumn tradition, but you can celebrate the game and get some exercise by playing a pickup game in the backyard. Invite the neighbors and make it a regular occasion. You’ll probably have way more fun actually playing the game than watching it and you’ll get healthy in the meantime. Even touch football can be a blast, and it’s not as impactful on your joints. 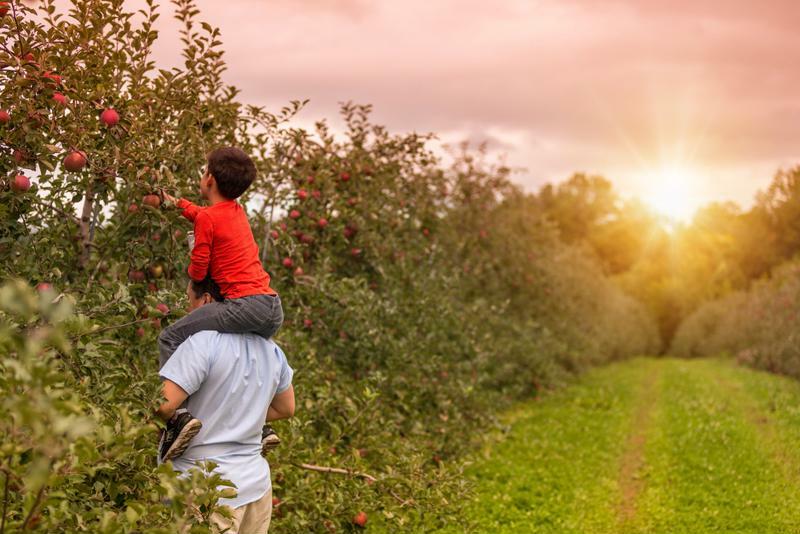 Apple picking is a fun way to spend time with your family. It’s not every day that you can go out and pick your produce fresh from the tree. Real Simple magazine suggested going apple picking for some family fun. You’ll get a bit of exercise and you’ll come home with a healthy treat. You can eat your apples as they are, or use them in your next baking recipe. You can also grab some delicious apple cider, which is only available for a short time every year. Cleaning up your lawn might not sound like the most fun, but it’s a necessary part of the season. Getting your yard clean and tidy for the winter will ensure that your grass looks green and vibrant when springtime comes around again. Popsugar suggested letting your kids help…and let them jump into the leaf piles! Besides racking up the fallen leaves, autumn is the perfect time to fertilize, plant grass seed and aerate the soil. Cleaning up the lawn might take a few weekends, but it’s a great way to stay active! If you live in an area that gets cold, it might be time to start moving some of your activities indoors. For instance, you might want to find an exercise video series that you enjoy, or develop a routine of your own. With a few weights, you can get a full workout from the comfort of your living room. This is also a great time to try out a few new healthy recipes. Rather than indulge in sweet desserts, you can use other seasonal flavors like squash and cinnamon to make delicious and nutritious meals. Autumn doesn’t have to be a downturn on your fitness chart, here’s ways on how to maintain your fitness. With a little focus and bit of effort, you can maintain your fitness goals and keep on track with your exercise routine. Grab your fitness device and try out one of these suggestions!